So this card should have been shared a looooong time ago! But I thought I’d share it with you today, as it was a previous catalogue launch party make and take project. So before I share the make and take from today’s party, here is an old one! This make and take featured a couple of products that have now been discontinued, including the baubles Stampin’ Around wheel, the Delightful Decorations stamp set, and the Ornament Extra-Large punch. 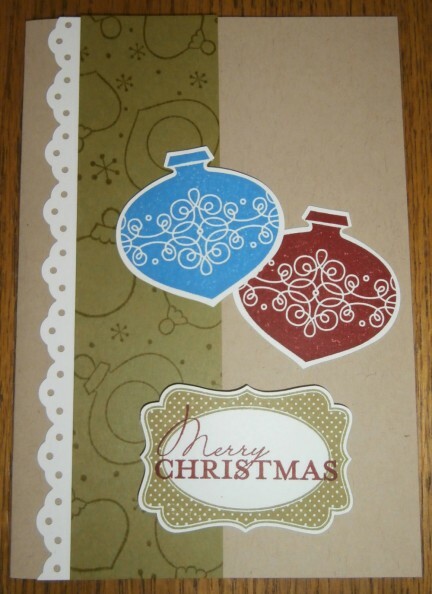 But it can still be a good card concept, and can easily be adapted to use different sets, especially the Ornament Keepsakes stamp set coordinated with the Holiday Ornaments framelits dies to keep it as a Christmas card. The colours are Pear Pizazz, Cherry Cobbler, Crumb Cake and (I think) Pacific Point. It sounds good enough to eat, if you ask me! The sentiment (from Contempo Christmas) was stamped onto a background that was stamped with the Four Frames stamps, and cut out with the Decorative Label Punch punch. The Whisper White edging was punched using the Eyelet Border to add a little detail to the card. I hope you like this card, even if some of the items have now retired, and that you are coming along to my New Catalogue Launch Party this weekend to try out a totally new project that uses new colours and stamp sets that you may not have used yet. See you there? Stamp Sets: Contempo Christmas, Delightful Decorations, Four Frames. Punches: Decorative Label Punch, Eyelet Border, Ornament Extra-Large. Colours: Cherry Cobbler, Crumb Cake, Pacific Point, Pear Pizazz, Whisper White.